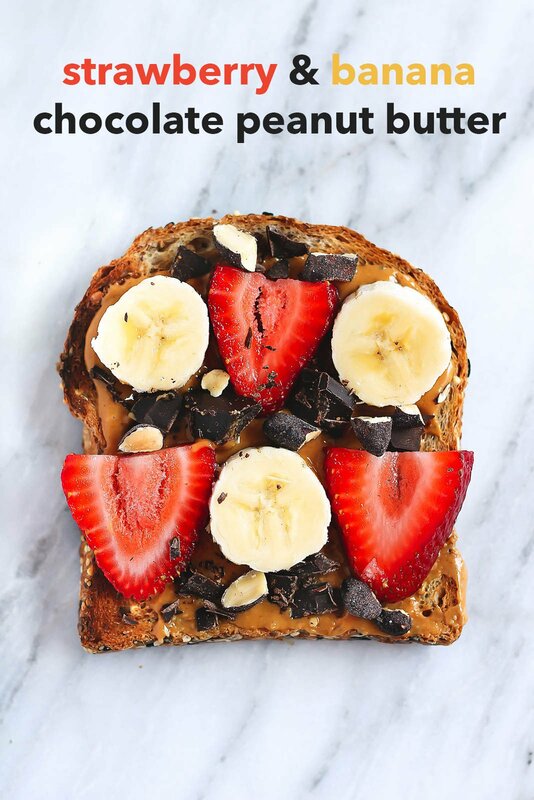 Wellness Wednesday: 4 Healthy Breakfast Toasts! Bread is back baby. That’s right, we’re toasting it up, then throwing on ALL the toppings on today’s Wellness Wednesday in partnership with my wonderful friends over at Blue Diamond. I don’t know about you, but morning toast happens to be one of my absolute favorite ways to enjoy a quick, nutritious breakfast. 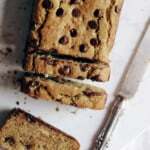 Over the past few years, bread has gotten a bad rap mostly due to people experimenting with gluten or grain free diets. Today I’m making a claim that bread (or toast) is back and ready to be enjoyed again! Before we dive into some of my favorites right now, I’d love to chat a little bit about what to look for when selecting bread. Here we go! Pay attention to the ingredient list. If there are multiple ingredients you can’t pronounce then more than likely that bread has plenty of unnecessary additives. The other day I picked up a “HEALTHY” loaf of bread, which had over 15 ingredients, most of which I couldn’t figure out unless I played Dr. Google. Go for sprouted bread. Sprouted bread makes some of the best toast and often has higher protein and fiber and as you may already know, helps to keep us fuller longer! Many say that sprouted grains are the best way for our bodies to absorb and digest the nutrition as sprouting helps to release the vital nutrients in the grain itself. Sprouted bread is not by any means gluten free. Here’s a great article that explains sprouted bread more in depth. More grains doesn’t always mean better. You’ll often see labels that say multi-grain or 10 grain bread, but that doesn’t mean that the bread is 100% whole grain or better for you. In fact, often times it can contain refined flour (which we like to avoid). Choose 100% whole grain or 100% whole wheat, or of course sprouted bread. Watch the sugar. Sometimes there can be up to 4g of sugar per slice of bread. It’s best to aim for only 1g of sugar or less. 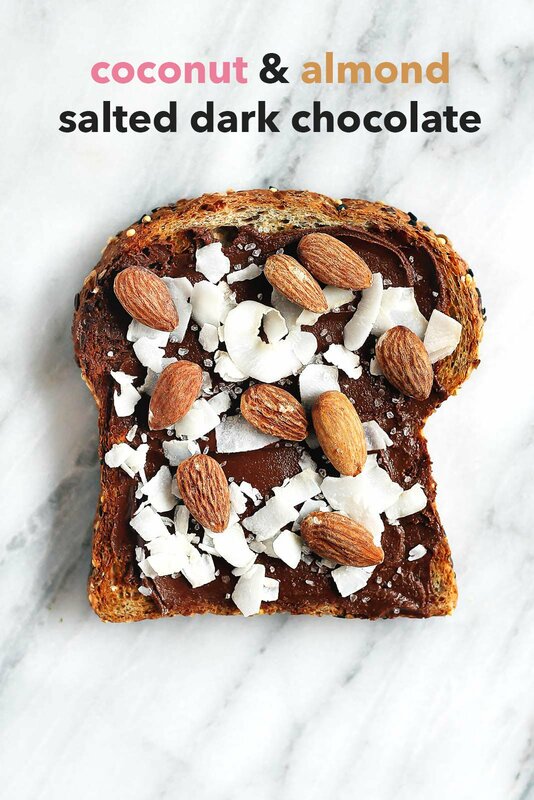 You can always add a sweet topping to your toast later (see below)! Now, let’s get to the toast toppings! 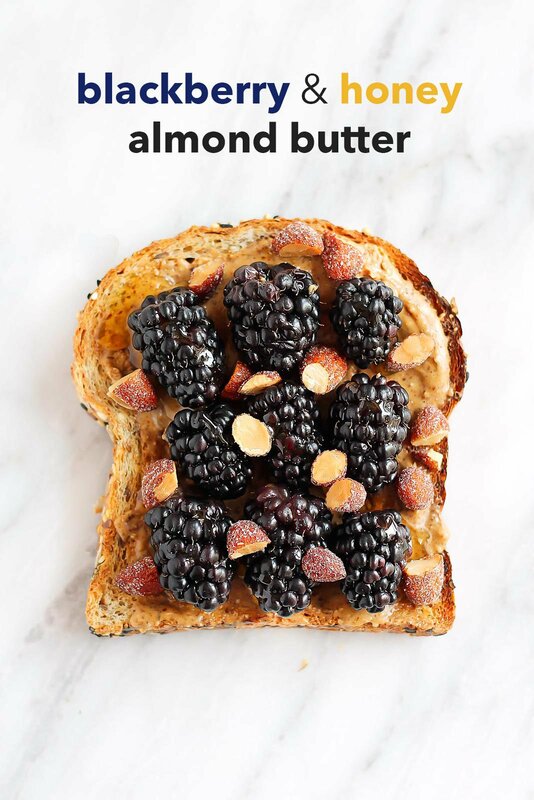 I love this breakfast toast because it has fiber & protein packed almond butter, a hint of antioxidants from blackberries, plus a little sweetness from honey and the crunchy honey coated almonds. Toast 1 slice of bread of choice (I prefer sprouted). Top with 1 tablespoon almond butter + 9 fresh blackberries + 1 teaspoon of honey + 1 tablespoon chopped Blue Diamond honey roasted almonds. Leftover greek yogurt that needs to be used up? Put it on your breakfast toast. 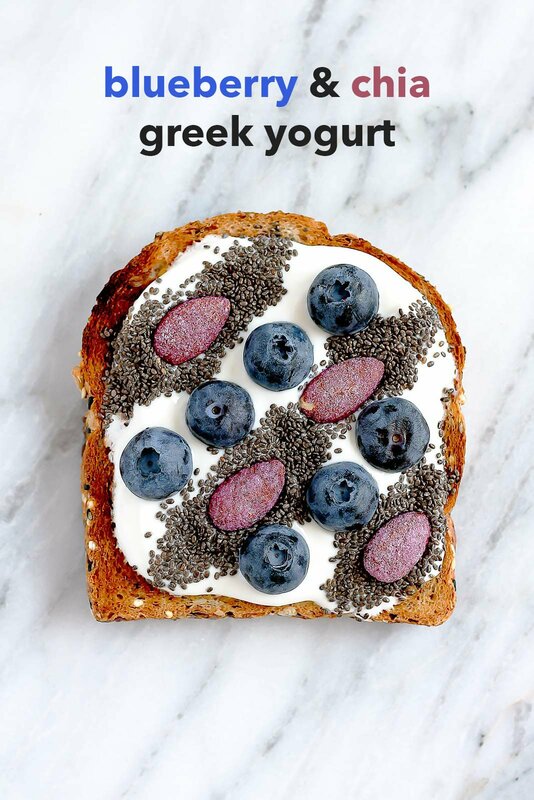 I love this toast because it has nutrition rich chia seeds that are full of fiber & omega 3s. It also contains probiotics and protein from the greek yogurt. 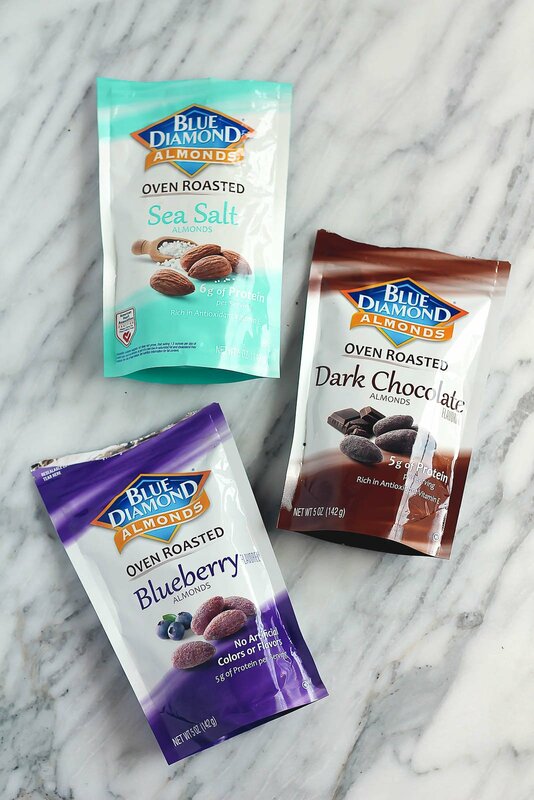 With each bite you’ll get crunchy, creamy and sweetness thanks to Blueberry Blue Diamond Almonds (seriously they are amazing). Top with 1/4 cup greek yogurt + 2 teaspoons chia seeds + a few blueberries + Oven Roasted Blueberry Blue Diamond Almonds. Can you imagine the flavors of a candy bar on your toast? Yes, it’s more than possible and the absolute best when you’re craving something sweet. 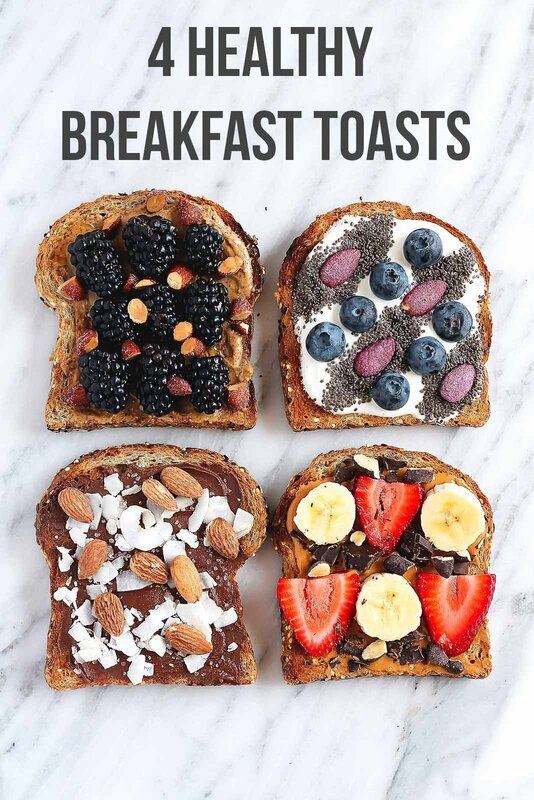 Because toasts can be for snacks or dessert, right? Absolutely! Truly one of my favorite toasts out there and often a breakfast favorite after a workout. 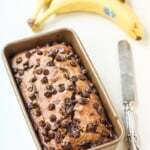 You get a hint of potassium & vitamin A from the strawberries & bananas. You’ll also get a good amount of protein from the peanut butter & Blue Diamond Oven Roasted Dark Chocolate Almonds. TOTALLY OBSESSED. 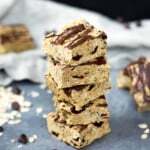 Top with 1 tablespoon natural peanut butter + banana slices + 1 square chopped dark chocolate + 1 tablespoon crushed Blue Diamond Oven Roasted Dark Chocolate Almonds. HUGE thank you to Blue Diamond for making these breakfast toasts even more extraordinary. Here are a few flavors I’ve been loving so far. 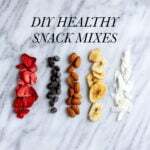 They’re great in DIY trail mixes or just popping after dinner when you’re craving something sweet. What’s your favorite breakfast toast creation? Leave a comment below so I can make it! This post is sponsored by Blue Diamond. All recipes, opinions & text are my own. Thanks for continuing to support AK and the brands that help make this site possible! 36 Responses to "Wellness Wednesday: 4 Healthy Breakfast Toasts!" Omg Salted Almond Joy? YES PLEASE. Looks fantastic Monique! Raspberry dark chocolate coconut would also be amazingggg. 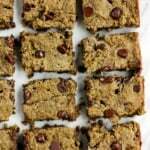 These look delicious, healthy, and filling! I got to try this coconutalmond salted dark chocolate, although alllll of these look amazing! These all look beautiful and delicious! I must try those blueberry almonds. The sea salt chunks, thoughh. I love whole wheat or whole grain toast with 1/3 less fat cream cheese and I put fresh sliced or can peaches and blueberries on it. 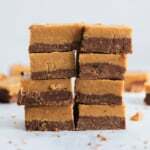 sounds crazy but topped with egg whites and all the almond and peanut butters! so delish! A dab of butter, burrata, sliced peaches, and balsamic vinegar. Maybe a slice of tomato and some basil. All of these creations are amazing & beautiful! I love combining sharp cheddar, natural pb, & apple slices on sprouted toast. I also love brie, figs, honey, & toasted nuts. Great post! So fun, creative and healthy, perfect way to start the day off right! Ummm wow, these all look amazing! I’m going to look for these new almonds! I love Blue Diamond Almonds! One of each, please! There are so many fantastic ideas here and Blue Diamonds almost make things better. I’ll take one of each too! I have always loved ezekiel toast with nut butter and fruit…any combination but blueberries and strawberries are my fave! That coconut needs to happen…great post! That coconut and almond salted dark chocolate is calling my name! My brother in law is gluten intolerant (he has not been diagnosed with Celiac) and he can eat sprouted grain bread with no trouble. What’s really cool is that you can actually make your OWN bread nowadays, plus customize them to your own! And there are seriously no limits to making toast. 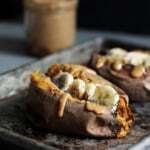 I love slathering some hummus, guacamole, Sriracha and veggies on a savory toast, or for a sweet alternative, fruit with nut butter, dark chocolate, cinnamon and maca powder! Oh my gosh, so many great ideas!!!! OMG! There are so many fantastic ideas here and Blue Diamonds almost make things better.